Air conditioners all come with a warranty, covering the individual components in the event one or more of them breaks down. In most cases, you won’t need to start looking for a new air conditioner until after the warranty expires. But by taking steps early in your air conditioner’s life, you can extend its longevity well past the warranty expiration date—by many years in some cases. Your mileage may vary but early action is key. The more you do over time to keep your air conditioner working at maximum efficiency, the longer it will last. Some steps simply involve judicious use of the air conditioner. You can set it to 78°F instead of 75°F, for instance, or turn the system off in the evening and open windows to keep cool. Other steps involve more formal services from a trained technician, but when used regularly, they can buy your system months or even years of extra life. They include. Maintenance isn’t the same thing as repairs. Repairs are supposed to address one particular problem, while maintenance is designed to catch any kind of problem early. A maintenance technician will give the system a thorough inspection: looking for worn lines, loose bolts, leaking refrigerant and any other issues that might turn into a serious repair somewhere down the line. That way, you can schedule repairs before the system breaks down, giving you the luxury of time to arrange for the repairs at your leisure and likely cutting down on the cost of the repairs to boot. In addition, by addressing all those little issues in one go, you cut down on wear-and-tear on the system, which helps it run more efficiently and can save you a great deal of money on monthly bills. When applied regularly over time—with maintenance planned once a year—it will also extend the life of the system. These devices are designed to treat excessive moisture in the air, which makes it feel hotter than it actually is. Dehumidifiers can help ease the burden on your AC system while preventing the growth of mold and bacteria. Electronic Air Purifiers. Dust and similar contaminant can coat the inside of your air conditioner, especially during the winter when it sits unused. That can increase wear and friction on your system. An electronic air purifier provides protection for your system against dust and dirt. Smart Thermostats. If your thermostat is more than ten years old, consider upgrading it with a smart model, which can analyze the cooling habits of your household and make micro-adjustments designed to improve the overall efficiency of the system. 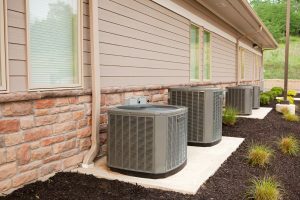 If you’d like to extend the life of your air conditioner and think that these options may be right for your home, call Rocky River, OH’s best air conditioning repair company: Westland Heating & Air Conditioning.